This topic contains 14 replies, has 9 voices, and was last updated by crotalusco 2 years, 10 months ago. I will go in the shop and check out my grinder if that one is affected. 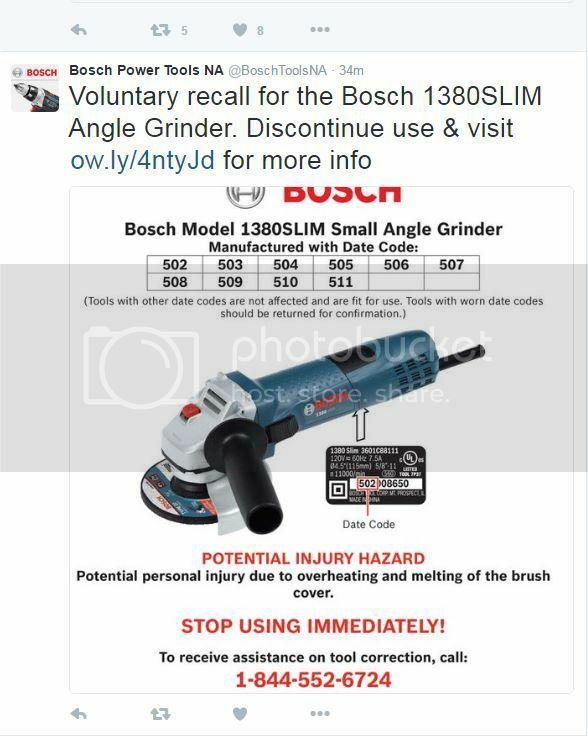 Good thing to do, I think I will visit the Bosch site and check out other recalled items, just in case. I don’t have one of those but I sent a message to a buddy that has a bunch of Bosch grinders in his shop, There’s a good chance he has at least one. I also called Bosch about how they’re going to handle it, They’ll send you out a shipping label and box to return and repair it for free. Cool! Is the recall only on the Slim grinders? Seems like the guts would be fairly similar across the board and others could be effected. What exactly are wring with them, just curious. I’ll have to check mine,, this is interesting with how long Bosch has been making grinders. nice ozturkebrahem. great that bosch took care of your old grinder and replaced it. Nice that Bosch took care of you. Bosch is a great company.